Nose: Crushed strawberries, mint, cedar. Mouth: Bright and light, wild strawberry fruit on the front of the pallet dominates. The neutral oak aging, allows the silky mid-palate to provide refreshing acidity, and dangling red currants and minerality to finish. Best served with a slight chill, allows the wine to show a beautiful varietal arc in the glass. 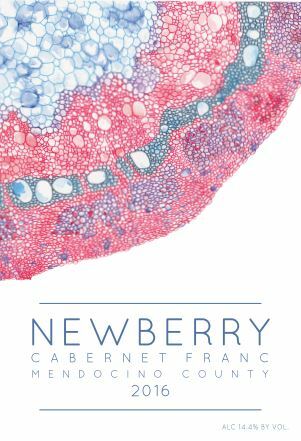 The Cabernet Franc hails from Ukiah in Mendocino County. The site rests on on the uphill slopes of the Russian River, as you drop into the Ukiah Valley from Hopland. These loamy, well-drained soils produce gorgeous clusters from rootstock over 25 years old.. Very fortunate to work with this fruit, sustainably managed from Julie's hometown.! Stylistically, I continue to focus on brightness and energy from the wine. By harvesting at optimum ripeness, we are fortunate to make this wine with no additives, extracting color with two manual punchdowns per day and pressing when completely dry. We then barreled down to neutral French oak for 14 months before bottling in the Spring of 2018.